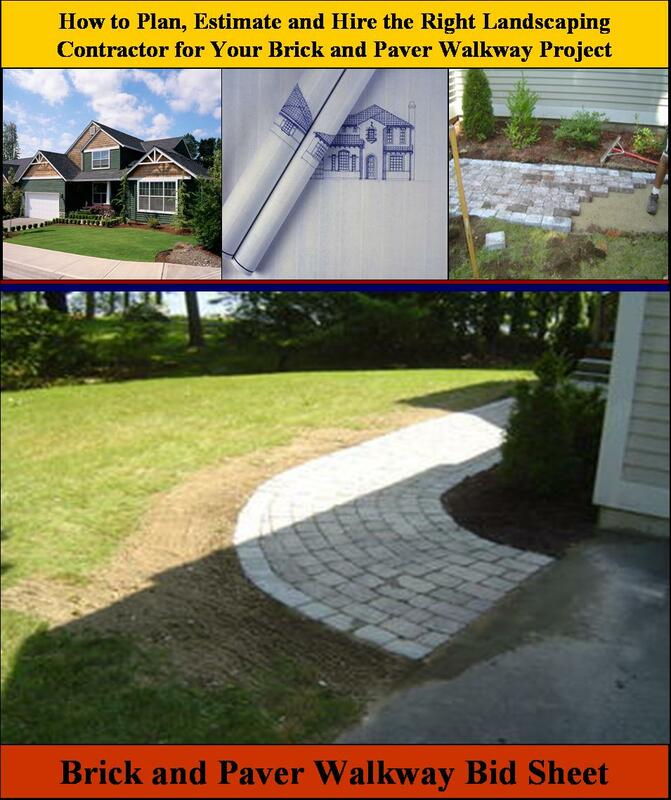 Planning to put in a new brick or paver walkway but don’t know where to begin or what landscaping Contractor to hire? Would you like to develop your own walkway construction plan and cost estimates to compare with contractor bid sheets? Do you know what questions to ask to ensure your hiring the right contractor for your walkway project? Ensure that your Brick or Paver Walkway project goes smoothly and you get the finished walkway you are looking for. Help keep your Brick or Paver Walkway project on time and budget! Order Now and Immediately Download the Brick and Paver Walkway Bid Sheet today. The Brick and Paver Walkway Bid Sheet costs only $11 and is 100% guaranteed. Learn what Questions to Ask before you hire Contractors! The Brick and Paver Walkway Bid sheet includes a request for proposal (RFP) form that you submit to prospective landscaping contractors for them to complete and provide back to you for review. The RFP form consists of over 50 questions on all aspects of installing a Brick or Paver Walkway. completed correctly. Finally, it provides overall walkway project costs estimates as well as break out costs for specific materials. The Brick and Paver Walkway Bid sheet also provides estimated time intervals for completing the project. Why Buy my Bid Sheets? Throughout my years of home construction experience, and while pursuing a professional career in the high tech space, I gained a wealth of experience working with general contractors and sub-contractors. I learned how to work with them, and most importantly how to hire them. From personal experience, hiring the wrong contractors is a disaster. Besides wasting a lot of time and money, you also find yourself in protracted arguments and difficult situations that no homeowner needs or wants. To help homeowners learn from my experiences I created a series of bid sheets. Each bid sheet is comprised of several key sections. The first section is an extensive questionnaire for potential contractors to complete. It asks all the questions that should be asked, but most homeowners are unaware to ask. The second section consists of rough expected costs and work intervals associated with the particular project. The final section is a comprehensive summary of my tips and advice on what to watch out for when reviewing contractor responses to the questionnaire. In addition, for major remodeling and construction bid sheets, I also provide a separate Cost Breakdown spreadsheet in Microsoft’s Excel format to allow homeowners to estimate and track their own actual home construction costs. By utilizing my Bid Sheets you will save time, money and hassles, and most importantly get the home construction project completed the way you want. If for any reason you are unhappy with one of my bid sheets, I will provide you with a 100% complete refund, no questions asked. If you are unsatisfied with this Bid Sheet email us and we will issue you a complete refund, no questions asked.